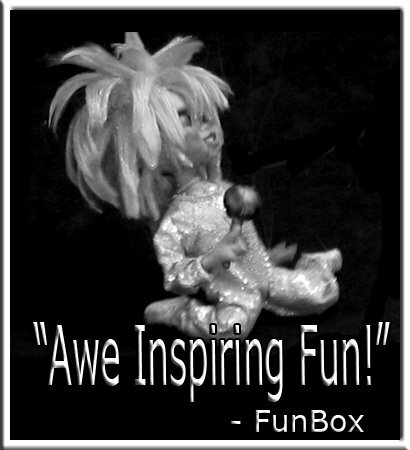 On Monday April 28, 2008 we here at FunBox had posted a candid appraisal of a musical act that performed at a local mall. There was an immediate and intense outcry against what had been deemed a “harsh” review. Claims were made that we, a comedy site on the internet, had perverted something intended as pure and innocent entertainment for children, into something perverted. After numerous requests to remove the posting or risk legal action, we quickly capitulated and took down the offending material. One of the core values that we hold dear at FunBox, is to listen to any complaint and do what they want. Who are we to have our own opinion? As one of the bibles says, “it is the braying donkey that gets fed.” So here is our revised review of the newest sensation in singing marionettes, the Teenie Tones™. A review of the show so great it makes me want to kill myself because I know life cannot possibly get any better. What would you say if I told you there was a planet that was far far away called Muzar? What if I told you it was inhabited by nine children who communicate through music? Now, what if I told you that those intergalactic kids are rock star puppets and they are going to fly on their Starship Harmony (that runs on clapping) and come visit a mall near you? If you are like me you would look around and ask to see God because hey, this must be heaven (more like heavFun)! But luckily you don’t have to die to experience this miracle, all you have to do is be fortunate enough to attend a Teeny Tones™ show! With inspired lyrics set to soul stirring music, these delightfully care free puppets rock their way through some of the most wonderful entertainment ever created ever. With so much negativity bombarding our children everyday, this wholesome group of puppet performers is just what every parent should feel obliged to take their children to. I have heard reports that a handicapped child went to a Teenie Tones™ show and left walking. The best part is that the fun doesn’t have to stop at the mall, the benevolent people behind the show have put together an assortment of tapes and shirts that will almost definitely help stop any child from becoming a homeless drug addict. Feel free to comment below with which Teenie Tones™ is your favorite! Mine is La-Le!